It is a great pleasure to welcome the new members of the Executive Council: Vice president: Tian Huang, Secretary General: Marco Ceccarelli, Treasurer: Joe Rooney, Members: Theodor Ionescu, Carlos Lopez-Cajun, and James Trevelyan. That is not to forget the continuing members: Manfred Hiller, Kristof Kedzior, and Hirofumi Miura. I very much look forward to working with the new E.C. and moving our organization forward. It is also very appropriate to thank the outgoing members of the Executive Council: Jean-Claude Guinot, Tatu Leinonen, Bob Bicker, Alberto Rovetta, and Gabor Stepan for their distinguished contributions. The effects of the postponement of the IFToMM World Congress due to the SARS outbreak were pervasive. I do thank our colleague Tian Huang and the Congress Organizing Committee for their flexibility and hard work in holding things together through this very trying period. We were rewarded by a very successful World Congress. Although I am sure some people who originally planned to attend the World Congress were not able to because of the changed date, we still had over 500 delegates and a very vigorous program of paper presentations. The next World Congress will be held in Besançon, France in 2007. Besançon is a very attractive old city in Northern France close to the Alps. There is easy access either directly by air, or by TGV from Paris. The Executive Council will meet in Besançon this year to review the proposed venue of the congress and meet with the organizing committee. One result of the postponement of the World Congress was a rather hectic period with a number of IFToMM conferences taking place in rapid succession. 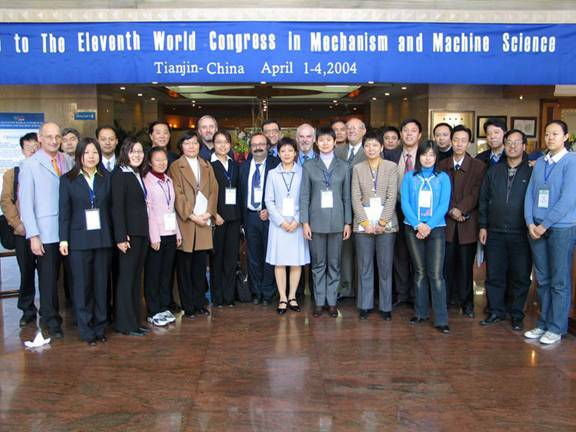 In addition to the World Congress in Tianjin (April 1st to 4th) there were HMM May 12th-15th 2004 in Cassino, Italy; RoManSy in Montreal, Canada, June 14th-18th 2004; and ARK in Sestri Levante, Italy, June 28th-July 1st 2004. Award of Merit: All members of the E.C. The E.C. decided at its meeting in Tianjin that, since it itself functions as the honors and awards committee, it is more appropriate to appoint an Honors and Awards Secretary to assist the E.C. than to have an Honors and Awards “Chair”. Professor Shoup has completed his term in this function and has elected to step down. Fortunately, Professor Teun Koetsier has agreed to fill the new position of Honors and Awards Secretary. IFToMM’s procedures do not allow posthumous nomination. However, if a candidate is nominated but dies before receiving the award there is no restriction on posthumous presentation. This was the case with our deeply mourned colleague Giovanni Bianchi. An international professional organization such as IFToMM is really about communication among members of the technical community. That communication takes many forms, many of them informal such as the interactions of members of our Permanent Commissions and Technical Committees. However, on a more formal level, under the auspices of the PC Communications we do sponsor conferences, maintain this web site and publish this newsletter. Likewise, under the PC Publications, we sponsor a growing list of journals. It is gratifying to report that these activities are in excellent health. That is not to say that we should not be evaluating these activities and pursuing ways to improve, and further invigorate them, particularly since, in many respects, these PC’s represent the public face of the Federation. That has been happening. Old established conferences such as ROMANSY have been revamped to make them more attractive to today’s professional community. Relatively new meetings such as the HMM conferences have added vitality to our organization. The recent appointment of Andres Kecskemethy as the new Editor in Chief of our flagship journal: Mechanism and Machine Theory has provided an occasion for reviewing and evaluating our journal activities. That is healthy and appropriate. Of course, there are also important activities that do not fall under these headings. The great effort of the PC Standardization of Terminology in publishing “Terminology for the Mechanism and Machine Science” particularly merits recognition in this context. I would like to thank, once more, all IFToMM Officers and the Chairs of Permanent Commissions and Technical Committees who have contributed to the present and past issues of the IFToMM Newsletter. This issue of the Newsletter contains a message from Professor Kenneth Waldron, IFToMM President, highlighting the IFToMM activities in 2004; two messages from Professor Marco Ceccarelli, new IFToMM Secretary General, regarding the IFToMM Executive Council and the IFToMM activities, the later one is included in all four official languages; as well as several contributions from IFToMM Officers including an announcement regarding the 2007 IFToMM World Congress which will take place on June 10-14 2007, in Besançon, France. Similar to previous issues of the Newsletter, the contributions are published in any of the four IFToMM official languages, English, French, German, and Russian. Contributions submitted in official languages other than English are expected to be accompanied by an English abstract. I continue to look forward to receiving your contributions for the 2005 issue of the Newsletter, preferably as a WORD document or in PDF format. The minutes of the EC meeting and General Assemly are posted in the IFToMM webpage: http://www.caip.rutgers.edu/IFTOMM/. Whilst IFToMM is the only international organization in the world whose primary aim is to promote Mechanism and Machine Science (MMS) within the scientific community, its activities are not well known outside its member countries. Furthermore, in some instances young researchers within some of the member countries do not even know of its existence or of its activities, and consequently do not realize the benefits to be gained from actively participating in them. Since its foundation in 1969 IFToMM has been active worldwide, largely through the enthusiastic action of a small group of individuals who believed, and still believe, that the exchange of scientific information and collaboration in mechanical engineering is fundamental not only for cultural and professional growth but also for enhancing the quality of life in society. Today, the third generation of IFToMM supporters appears not to be so much aware of the significance of its activity and its visibility is therefore becoming somewhat nebulous. The first IFToMM generation can be identified by those individuals who stimulated and contributed to the evolution of IFToMM from the 50’s through to the late 70’s, and up until the 4th IFToMM World Congress held in 1979, in Newcastle upon Tyne, UK. The second IFToMM generation can be identified primarily by individuals who were pupils of the founding fathers of IFToMM, or in people who have participated in promoting the activities of IFToMM through the 80s’ and 90s’, up until to the 10th IFToMM World Congress held in 1999 in Oulu, Finland. The third IFToMM generation can be considered those individuals who have been fully educated in MMS and who, up until the present represent a younger age group, perhaps in their early 40s. It is this generation who should be strongly encouraged to lead IFToMM into the 21st millennium. 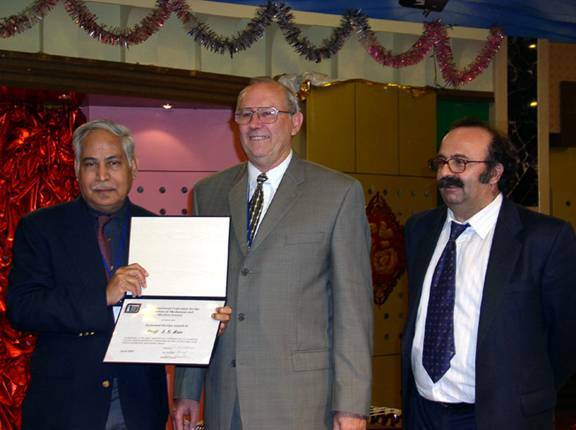 The significance of IFToMM and its activity are clearly stated in Article 2 of IFToMM Constitution: “To promote research and development in the field of Machines and Mechanisms by theoretical and experimental methods, along with their practical application.” In the same article there is also particular emphasis on the importance of social interaction among individuals by giving to IFToMM the mission of promoting contacts, collaborations, conference events, and meetings by people working in the field of MMS. Traditionally, much of IFToMM’s activities are run by the Permanent Commissions (PCs) and Technical Committees (TCs) through regular meetings, workshops and conferences, and via collaborations within the membership of the PCs and TCs. The Chairs of each of the PCs and TCs are generally the main promoters of their specific activity within MMS, however, without the enthusiasm and participation of the individual PC and TC membership, this success would not be possible. In order to revitalize the interest of individual researchers in the field of MMS, it was recently decided to invite a wider participation by attracting younger people to become active members of IFToMM PCs and TCs. Without this active support, organizations such as IFToMM will not continue, and its very existence is more dependent on the success of this involvement than at any time in the past. It is for this reason that a proposal has recently been put forward to amend the constitution to permit individual associate membership of IFToMM. The main advantages to individuals will be: direct involvement in IFToMM activities and obtaining information on these activities; the opportunity to promote and stimulate specific IFToMM activities; being personally affiliated to the only worldwide federation in the field of Mechanical Engineering. The main advantages to IFToMM will be: having greater numbers of active individuals helping to promote IFToMM activities; a much greater visibility within the scientific community; having increased financial resources to facilitate wider activities; and having a direct link with researchers and scientists working in the field of MMS. However, the Federation, which is the principle attribute of IFToMM, will be preserved since individual associate members will have no voice or vote on IFToMM discussions. The national or territory organizations, who are the members of IFToMM, will be not affected by membership of associate individuals, since they cannot be recognized as members of the national or territory organizations, which have their own rules and constitutions, even for the election of the Chairperson in IFToMM. Is IFToMM capable of attracting more and more attention? Are the activities of IFToMM addressing new problems and fields? Are the outcomes of IFToMM activities useful for the Engineering Community and Society at large? Are the IFToMM activities successfully linked to the teaching, research, and practical application in engineering? How can IFToMM be perceived as being more attractive, particularly to young researchers and engineers? One can address many other issues, which can be considered as fundamental to the future development and evolution of IFToMM. The above questions can be considered of primary importance, because they are strongly related to the problem of promoting the worldwide visibility of IFToMM. The visibility of IFToMM activities is concerned not only with illustrative information and reports on WebPages or printed media, but with the awareness and circulation of plans and results among individuals and institutions. Today, WebPages are considered to be a fundamental means of communicating information via open public forum, and therefore IFToMM should take particular care in addressing the regular updating of website, to which the PC on Communications is devoted. The activity of individuals within IFToMM is also of fundamental importance in helping to promote further individual participation. Furthermore, the recognition of eminent IFToMM personalities through the existing IFToMM awards should be better emphasized and announced world wide. Nevertheless, the appropriate level of visibility for IFToMM and its activity depends mainly on the active individuals within IFToMM at all levels, through their personal and institutional contacts. Thus the awareness of the significance of IFToMM requires everyone to be kept properly informed and wherever possible involved in its activities. We can be optimistic about the future of IFToMM, that with the continued help of its officers and the many other individuals upon whose success it depends will continue to react positively to the challenging demands for improving the technical knowledge within the field of MMS and ultimately for enhancing the quality of life within Society. In summary, IFToMM is a truly international and worldwide community of individuals who can and must continue to give their own contributions on an individual basis or through the institutional framework to promoting the activities of IFToMM with respect to the many and varied aspects of MMS. IFToMM est la seule institution mondiale en ingénierie mécanique, mais ses activités sont bien souvent inconnues dans les pays qui ne sont pas encore membres d'IFToMM. Même chez les pays membres, le rôle d'IFToMM est parfois mal compris. Il arrive aussi que les jeunes chercheurs ne connaissent pas son existence ou ne réalisent pas les avantages dont ils peuvent bénéficier en s'impliquant dans ses activités. L'activité mondiale d'IFToMM a commencé dès sa création en 1969, grâce à l'enthousiasme de certains individus, qui pensaient et pensent toujours que les collaborations et les échanges en ingénierie mécanique, en particulier dans le domaine des machines et des systèmes mécaniques (abréviation anglaise : MMS), sont non seulement nécessaires à l'épanouissement personnel, à la fois culturel et professionnel, mais aussi à l'amélioration de la qualité de vie de la société. Aujourd'hui, la troisième génération des membres d'IFToMM ne semble pas tellement se rendre compte de l'importance des activités d''IFToMM et du fait qu'elles sont de moins en moins bien perçues. Les membres de la première génération d'IFToMM sont les personnes qui ont pris part à sa fondation, des années 50 aux années 70, disons jusqu'au congrès international d'IFToMM qui s'est tenu en 1979 à NewCastle. La deuxième génération peut s'apparenter aux élèves des pères fondateurs d'IFToMM et aux personnes qui ont participé aux activités d'IFToMM dans les années 80 et 90, jusqu'au congrès international d'IFToMM qui a eu lieu en 1999 à Oulu en Finlande. La troisième génération d'IFToMM est composée de personnes qui ont été entièrement instruites sur les MMS. Ce sont ces personnes, qui ont aujourd'hui une quarantaine d'années, qui feront/devront faire avancer les activités d'IFToMM dans les premières décennies du 21ème millénaire. La signification d'IFToMM et ses activités sont énoncées dans l'article 2 de sa constitution : 'Favoriser la recherche et le développement dans les domaines des machines et des mécanismes par des méthodes théoriques et expérimentales, ainsi que leurs applications'. Dans ce même article, on souligne l'interaction sociale, en donnant à IFToMM la mission de favoriser les contacts, les collaborations, les conférences et les réunions entre les personnes travaillant sur les MMS. Traditionnellement, la majeure partie de l'activité d'IFToMM est gérée par ses comités techniques (CTs) et ses commissions permanentes (CPs) à travers des réunions, conférences et collaborations internes organisées par leurs membres. La plupart du temps, les personnes présidant les CTs et les CPs sont les principaux acteurs des activités d'IFToMM, mais sans l'intérêt et la participation de tous, le succès ne serait pas possible. Depuis peu, une action importante est menée afin de redynamiser l'attention et la participation des personnes, en demandant et en proposant à plus de monde à devenir membre actif des CPs et des CTs d'IFToMM. Sans le travail des individus, une institution ne peut pas exister et, de nos jours, l'existence d'IFToMM semble être plus sensible que dans le passé. C'est pourquoi, depuis l'année dernière, une proposition pour un amendement à la constitution a été soumise afin de faire apparaître le statut de membres associés à IFToMM. Les principaux avantages pour ces personnes seront : d'être directement impliquées dans les activités d'IFToMM ; d'obtenir directement des informations sur les activités d'IFToMM ; d'avoir la chance de favoriser et de mener des activités spécifiques ; d'être personnellement affiliées à la seule institution mondiale dans le domaine de la construction mécanique. Les avantages principaux pour IFToMM seront : d'avoir des membres plus actifs pour mener ses activités ; d'être mieux perçu ; d'avoir plus de ressources financières pour valoriser ses activités ; d'avoir un lien direct avec les personnes travaillant dans le domaine des MMS. Cependant, le caractère spécifique d'IFToMM, qui réside dans la nature de sa fédération, sera préservé puisque les différents membres associés ne pourront pas intervenir ni voter dans les discussions d'IFToMM. Les organismes nationaux ou territoriaux, qui sont membres d'IFToMM, ne seront pas affectés par l'adhésion des membres associés à IFToMM. En effet, ils ne peuvent pas être automatiquement identifiés comme membres de ces organismes, qui ont leurs propres règles et constitutions. Cela concerne aussi l'élection du président d'IFToMM. IFToMM peut-il attirer de plus en plus l'attention ? l'activité d'IFToMM doit-elle également s'élargir à de nouveaux problèmes et domaines ? les résultats de l'activité d'IFToMM sont-ils utiles pour la société et la communauté d'ingénieur dans son ensemble ? l'activité d'IFToMM est-elle liée avec succès à l'enseignement, à la recherche et à la technologie ? comment IFToMM peut-il être plus attrayant, principalement pour les jeunes chercheurs et ingénieurs ? Il est possible de rebondir sur beaucoup d'autres domaines, qui peuvent être considérés comme fondamentaux pour le développement futur et l'évolution future d'IFToMM. Les quelques questions mentionnées ci-dessus peuvent être considérées comme étant de première importance, parce qu'elles sont fortement liées au problème de la manière de percevoir les activités d'IFToMM. La perception de ces activités concerne non seulement les rapports et les informations que l'on trouve sur le site web ou les brochures, mais sert aussi à faire connaître et circuler les projets et les résultats parmi les individus et les établissements. Aujourd'hui, le Web est considéré comme un moyen fondamental de communication de l'information vers un large public, donc IFToMM devrait prendre un soin particulier à mettre à jour son site Web. La CP de communication est dédiée à cette tâche. Percevoir les activités des membres d'IFToMM est fondamentale pour favoriser plus de participations. Ainsi, les récompenses données pour reconnaissance aux personnalités d'IFToMM devraient être davantage soulignées et annoncées dans le monde entier. Néanmoins, la manière dont IFToMM et ses activités sont perçues dépend fortement de la promotion que chaque individu peut faire au travers de contacts personnels et institutionnels, et ceci à n'importe quel niveau. Prendre conscience de la signification d'IFToMM exige d'être correctement informé mais également impliqué dans ses activités. Nous pouvons être optimistes, IFToMM, avec l'aide de ses officiers et de beaucoup d'autres individus, pourra réagir constructivement aux futurs challenges, en améliorant les connaissances techniques concernant les MMS et, finalement, contribuer à améliorer la qualité de vie de la société. Pour résumer, IFToMM est une communauté mondiale d'individus qui peuvent et doivent apporter leurs propres contributions, qu'elles soient modestes ou plus impliquées dans l'institution, aux activités d'IFToMM dans les différents domaines des MMS. IFToMM ist die einzige weltweite Institution im ingenieurwissenschaftlichen Maschinenbau. Dennoch sind ihre Aktivitäten nicht in allen Ländern bekannt, vor allemsolche,die noch nicht IFToMM-Mitglieder sind. Selbst in Ländern, die bereits IFToMM-Mitglieder sind, wird die IFToMM oft nicht wahrgenommen und selbst jungen Forschern ist die Existenz von IFToMM unbekannt und sie können daher die Wichtigkeit, in IFToMM Aktivitäten eingebunden zu sein, nicht erkennen. IFToMM ist seit ihrer Gründung im Jahre 1969 weltweit aktiv durch die engagierte Mitarbeit von Einzelnen die glaubten und davon auch heute noch überzeugt sind, dass Zusammenarbeit und Erfahrungsaustausch im Maschinenbau mit dem Schwerpunkt Maschinen- und Konstruktionstechnik (MMS) grundlegend ist für die eigene ingenieursmäßige und berufliche aber auch für die gesellschaftliche Entwicklung. Für die heutige dritte Generation von IFToMM Aktivisten ist die Bedeutung der IFToMM Aktivitäten jedoch immer unklarer und das Erscheinungsbild immer diffuser. Die erste IFToMM Generation kann durch diejenigen definiert werden, die die Gründung von IFToMM in den Fünfzigern bis Siebzigern vorangetrieben haben, etwa bis zum IFToMM Weltkongress 1979 in Newcastle upon Tyne. Die zweite Generation bestand aus den Schülern der „Gründerväter“ oder jenen, die in den Achtzigern und Neunzigern, also etwa bis zum IFToMM Weltkongress 1999 in Oulu, Finland, an IFToMM Aktivitäten teilnahmen. Die dritte Generation wiederum ist im Wissen um die IFToMM aufgewachsen und stellt heute eine Gruppe von im wesentlichen 40-jährigen, die die heutigen IFToMM Aktivitäten auch in führenden Positionen in das 21. Jahrhundert führen sollen und werden. Die Bedeutung der IFToMM und ihre Aktivitäten sind in Artikel 2 der IFToMM Verfassung festgehalten: ‘Forschung und Entwicklung auf dem Gebiet der Maschinen und Mechanismen durch theoretische und experimentelle Methoden verbunden mit der praktischen Anwendung zu fördern.’ Gleichzeitig wird in Artikel 2 spezieller Wert auf die Zusammenarbeit zwischen Personen gelegt, indem innerhalb der IFToMM Kontakte, Zusammenarbeit, Konferenzen, Tagungen und Workshops zu den IFToMM-spezifischen Themen gefördert werden. Traditionell ergeben sich die meisten IFToMM-Aktivitäten durch die Technical Committees (TCs) und die Permanent Commissions (PCs) in der Form von Treffen, Konferenzen und direkter Zusammenrbeit zwischen den Mitgliedern der TC’s und PC’s. Meist sind die Vorsitzenden der TC’s und PC’s die Hauptakteure, aber ohne die Beteiligung aller übrigen wäre deren Erfolg nicht möglich. Unlängst wurde eine wichtige Aktion gestartet, um die Aufmerksamkeit und die Teilnahme von Personen als aktive Mitglieder der IFToMM PCs und TCs zu verbessern. Ohne das persönliche Engagement kann keine Institution überleben und dies scheint besonders für IFToMM zu gelten, gerade auch im Vergleich zur Vergangenheit. Dies ist der Grund, warum im letzten Jahr ein Änderungsvorschlag für die IFToMM Verfassung eingereicht wurde, um eine assoziierte Individualmitgliedschaft einzuführen. Der Hauptvorteil für solch eine Mitgliedschaft wird die direkte Einbindung in die IFToMM-Aktivitäten sein, direkte Informationen über die IFToMM-Aktivitäten zu erhalten, die Möglichkeit spezifische Aktivitäten zu fördern und anzuregen, und persönlich der einzigen weltweiten Institution im Maschinenbau angegliedert zu sein. Der Hauptvorteil für IFToMM wird darin liegen, mehr aktive Personen für IFToMM-Aktivitäten zu gewinnen, eine bessere Präsenz zu erreichen, mehr finanzielle Möglichkeiten für mehr Aktivitäten und einen direkteren Zugang zu Personen, die im Bereich MMS arbeiten, zu haben. Trotzdem wird die wichtigste Eigenschaft der IFToMM, der föderale Charakter, erhalten bleiben, da die assoziierten Individualmitglieder weder Stimme noch Stimmrecht innerhalb der IFToMM haben werden. Die nationalen oder territorialen Organisationen, die IFToMM Mitglieder sind, werden nicht durch die assoziierte Individualmitgliedschaft berührt, denn diese werden nicht automatisch Mitglieder der nationalen oder territorialen Organisationen, die ihre eigenen Regeln und Verfassungen gerade auch im Hinblick auf die Wahl der Vorsitzenden innerhalb der IFToMM haben. Ist IFToMM in der Lage, mehr und mehr Aufmerksamkeit zu erzeugen? Sind die IFToMM Aktivitäten auch auf neue Probleme und Themenbereiche ausgerichtet? Sind die Ergebnisse der IFToMM Aktivitäten nützlich und sinnvoll für die Ingenieurgemeinschaft insgesamt? Sind die IFToMM Aktivitäten erfolgreich im Bereich Lehre, Forschung und praktische Anwendung verwurzelt? Wie kann die IFToMM für junge Forscher und Ingenieure noch attraktiver werden? Man kann noch viele weitere Problemkreise identifizieren, die als fundamental für die zukünftige Entwicklung und Evolution der IFToMM angesehen werden können. Die oben genanten Fragen sind von elementarer Bedeutung u.a. deshalb, weil sie stark mit dem Erscheinungsbild der IFToMM zusammenhängen. Das Erscheinungsbild der IFToMM Aktivitäten ergibt sich nicht nur durch aussagekräftigen Berichten und Informationen durch Internet Auftritte und gedruckten Broschüren, sondern auch durch das Vorhandensein und die Verbreitung von Vorhaben und Ergebnissen durch und zwischen Personen und Institutionen. Heutzutage werden Webseiten als grundlegende Mittel für die Verbreitung von Informationen an die Öffentlichkeit verwendet und daher sollte die IFToMM mit besonderer Sorgfalt die Pflege ihres Internetauftrittes betreiben, so wie sich der PC für Kommunikation dieser Aufgabe widmet. Das Erscheinungsbild der IFToMM Aktivitäten einzelner Personen ist von fundamentaler Bedeutung für die Förderung weiterer individueller Mitwirkung. Daher sollte die Außenwirkung von IFToMM Persönlichkeiten durch die existierenden IFToMM Auszeichnungen stärker betont und weltweit verbreitet werden. Nichtsdestotrotz hängt ein gutes Erscheinungsbild der IFToMM und ihrer Aktivitäten stark von fördernden Aktionen der mit der IFToMM eng verbundenen Personen auf allen Ebenen ab, sei es durch persönliche oder institutionelle Kontakte. Die Wahrnehmung über den Stellenwert von IFToMM erfordert es, genau über IFToMM Aktivitäten informiert und vor allem involviert zu werden. Wir können optimistisch sein, dass die IFToMM mit der Hilfe ihrer Officers und vieler anderer Persönlichkeiten in der Lage sein wird, positiv auf die Herausforderungen zu reagieren, die bei der Verbesserung des technischen Wissens im Bereich MMS zu meistern sind. Letztlich kann dadurch eine Verbesserung der Lebensqualität in der Gesellschaft erreicht werden. Zusammenfassend stellt sich die IFToMM als ein weltweiter Verband von Persönlichkeiten die ihren eigenen Beitrag zu den IFToMM Aktivitäten leisten können und müssen, sei es auf individueller Basis oder innerhalb des institutionellen Rahmens. IFToMM – это единственная всемирная организация инженеров-механиков. IFToMM сформировалась как организация в 1969 г. благодаря стараниям людей, веривших, что сотрудничество и обмен опытом в инженерной области являются очень важными для культурного, профессионального роста и повышения качества жизни общества в целом. Однако, деятельность этой организации недостаточна известна как в странах членах IFToMM, так и в других странах. Кроме того, молодые исследователи мало используют обширные возможности этой организации. А ведь будущее IFToMM зависит именно от них. Первое поколение IFToMM сформировалось из исследователей 50-70 годов участвовавших в конгрессе в Нью-Кастле (1979). Второе поколение состоит из учеников отцов-основателей IFToMM, а также из исследователей, которые участвовали в деятельности IFToMM в 80-90 годы, до Всемирного конгресса в Оулу (1999). Третье поколение - это специалисты в области машин и механизмов. Сегодня им сорок и они должны будут продолжить деятельность IFToMM в первые десятилетия XXI века. Назначение IFToMM и его деятельность определены во 2-й статье конституции IFToMM: «Продвигать и развивать исследования в области машин и механизмов теоретическими и экспериментальными методами, одновременно с их практическими приложениями». В этом программном документе особое внимание уделено вопросам коммуникаций между членами, расширению контактов, совместному сотрудничеству, участию в работе конференций, проводимых в области исследования машин и механизмов. Традиционно, основную частью работы в IFToMM выполняют Технические Комитеты и Постоянные Комиссии в рамках встреч, конференций. Обычно представители Технических Комитетов и Постоянных Комиссий - главные участники деятельности IFToMM, но без участия всех остальных членов успех не возможен. Последнее время большое значение уделяется вопросам привлечения новых членов к деятельности IFToMM. Такой подход позволяет решать задачи IFToMM, связанные с дальнейшим развитием организации. Поэтому в прошлом году принято решение ввести понятие «ассоциированный индивидуальный член IFToMM». Основное преимущество такого членства состоит в возможности прямого участия в деятельности IFToMM, получении новой информации о ее деятельности. Это дает шанс продвигать и стимулировать специфические виды деятельности, возможность получать персональные приглашения в одну из всемирных организаций инженеров-механиков. Главное преимущество такой стратегии для IFToMM состоит в том, что открывается возможность привлечения большего числа активных членов, получение дополнительных источников финансирования, установлении прямых связей со специалистами в области теории машин и механизмов. Однако, ассоциированные члены не имеют голоса на процедурах выборов в IFToMM. Поэтому национальные и территориальные организации, являющиеся членами IFToMM, не могут изменить свой статус под воздействием ассоциированных индивидуальных членов. Они не являются членами организаций, что важно при процедуре выборов председателя IFToMM. В состоянии ли IFToMM привлечь к себе повышенное внимание? Направлена ли деятельность IFToMM на решение проблем в новых областях науки? Являются ли результаты деятельности IFToMM полезными для инженерного сообщества? Необходима ли деятельность IFToMM для преподавателей, исследователей и инженеров? Как повысить привлекательность IFToMM для молодых исследователей и инженеров? Перспективы деятельности IFToMM связаны не только с отчетами и информацией на страницах Интернет или опубликованием их в печати, но в первую очередь это распространение информации и результатов исследований между членами организации. Сегодня Web-страницы рассматриваются как мощное средство передачи информации широкой публике, и поэтому IFToMM должен проявлять повышенное внимание вопросам обновления своих web-страниц. Использование этих возможностей позволит быть информированным должным образом и даже вовлеченным в деятельность IFToMM. Необходимо подчеркнуть, что развитие и перспективы IFToMM существенно зависят от рекламной поддержки, которая может быть организована как постоянными членами IFToMM, так и ассоциированными индивидуальными членами в рамках личных и рабочих контактов. Несмотря на существенные проблемы, мы остаемся оптимистами и верим, что с помощью постоянных и ассоциированных членов IFToMM будет в состоянии постоянно повышать уровень технических знаний в области машин и механизмов, что в конечном счете будет способствовать повышению качества жизни общества в целом. Подводя итоги, можно сказать, что IFToMM - международное сообщество ученых, которые принимают самое активное участие в развитии теории машин и механизмов. The French committee was designated as the organizer of the 2007 IFToMM World Congress during the 2004 World Congress in Tianjin , China . The meeting will take place on June 10-14 2007 , in Besançon , France 's greenest town, a historical city which has a long-standing tradition in mechanism theory, especially for clock and watch making. Besançon is ideally located in the east part of France , close to Germany and Switzerland and with very good connections with different major airports. Technical tours to major French companies (Peugeot, Alstom, Schlumberger) will be organized as well as post-congress tours ( Jura , Burgundy , Strasbourg ). A preliminary Web page is available at: www.iftomm2007.com and the Call for Papers will be available in January 2005. A special emphasis will be put on the review process: we expect a large number of submissions and the review process should ensure that high quality papers will be presented, while allowing to represent all the branches of Mechanism and Machines science. The French committee is hoping to meet you during the World Congress: do not hesitate to contact the organizers for any further inquiries, preferably by e-mail. The 21st working meeting of the IFToMM Permanent Commission for Standardization of Terminology will take place next year, between 27th of June and 2nd of July, in Slovakia. Benefiting by IFToMM financial support, the meeting will be hosted by the Faculty of Mechanical Engineering of the Technical University of Kosice, being taken care by Prof. Stefan Segla of the Department of Applied Mechanics and Mechatronics and by the IFToMM National Committee of Slovakia. Among the topics to be cosidered at this working meeting are: completing the last edition of MMS Terminology (2003) with Chapters 7 – 13 in French, German and Russian languages, delivering the electronic version of the 2003 MMS Terminology, launching our PC Internet site, discussing the reaction comments and proposals of MMS community to this terminology edition, and laying the bases for new working domains. Some organizational problems will be dealt too. A symposium in MMS terminology problems will take place. I have the honour and pleasure to invite all those interested in MMS terminology and adjacent problems to send us their comments, proposals, and contributions aimed at its enhancement and world wide promotion. (Stefan Segla: Stefan.Segla@tuke.sk ; Theodor Ionescu: theodor.ionescu@cfr.ro). Computational kinematics is the branch of kinematics research involving intensive computation not only of the numerical type, but also of a symbolic or geometric nature. The first aim of computational kinematics is to sustain theoretical analysis with symbolic calculus, which allows one to deal with complex manipulation while focusing on the structure of the problem at hand. A second aim is to consider that the solutions of a problem will be finally obtained through the use of a computer: ii is hence necessary to determine what the best combination of problem formulation and numerical tools is in view of an efficient implementation. For example, the most elegant formulation may not be the best one to be used in the computer algorithm as we may lack the necessary mathematical tools to exploit the formulation. On the other hand it may be necessary to develop or adapt numerical tools to get an efficient algorithm. In that sense, theory and implementation are feeding each other. Computational kinematics benefits from the advance in numerical methods that has occurred in the recent years. This is true for algebraic geometry that provides a sound mathematical background but also efficient software for optimization and system solving: elimination, multi-resultant, homotopy or Gröbner basis. But alternate methods for dealing with non-algebraic problems are nowadays also available, such as interval analysis. Computational kinematics has provided amazing results in the last 10 years. One example of these results is the treatment of the direct kinematics of Gough platform that was considered by Freudenstein as the "Everest of modern kinematics". Until the late 80's there was almost no result on the number of solutions or on how to compute safely the solution. In 1988 Griffis and Charentus simultaneously show that a special case (when the platform is a triangle) has up to 16 solutions: their proof rely on elimination theory and symbolic computation allowing both to determine the maximum number of solutions and to implement an algorithm for calculating them. In 1991 Lazard proved by using Gröbner basis that if the base and the platform were planar, then the maximum number of solutions would be 40. In 1992 almost simultaneously Raghavan and Ronga prove that the general case would also have 40 complex solutions (the proof of Raghavan was based on homotopy). In 1994 Husty, using symbolic computation and elimination theory, was able to produce a 40th order univariate polynomial whose solutions allow determining all the solutions. In 1998 Dietmaier designed a numerical algorithm to exhibit examples with 40 real solutions. Nowadays we have two methods that can provide certified solutions (the solutions are exact and none is lost) in a computation time between a few seconds to less than one minute: Gröbner basis (with the package FgB/RS provided by Faugere/Rouillier) and interval analysis. But this problem is not yet completely solved: indeed if we are able to calculate efficiently all the solutions, there is no known algorithm that allow to determine in the solutions set which is the current pose of the platform. Finding such algorithm is one of the difficult challenges that Computational Kinematics has to solve. The Technical Committee of Computational Kinematics is sustaining this research by supporting two main events: the Advances in Robot Kinematics workshop (ARK) and the Computational Kinematics seminar (CK). These workshops are held in alternation every 2 years. Many important results have been presented during these events: for example Husty and Dietmaier presented their results during the ARK workshop. The Technical Committee of Computational Kinematics has also launched an all-electronic peer-reviewed Journal, the Electronic Journal of Computational Kinematics (EJCK). The Committee believes that the use of the computer media may favor the development of modern kinematics: 3D animation may contribute to highlight the contributions of the paper, software can be made available and compared on pre-defined benches and update will be possible. Such type of journal may hence act as a complement to more classical journal such as Mechanism and Machine Theory. However the journal has had some difficulties to find contributors: the current academic system in our field is for the moment quite reluctant regarding electronic journals and this does not favor original and high quality contributions. Consequently the Committee has decided to put EJCK in a stand-by mode and to re-launch it as soon as the conjecture will appear to be more favorable. The success of HMM2000 was repeated at HMM2004, International Symposium on History of Machines and Mechanisms that was held in Cassino (Italy) from May 12-15, 2004. Papers were presented by authors coming from all around the world covering the wide field of History of Mechanical Engineering and particularly History of MMS. History of IFToMM is also outlined through the historical activities of some of its Commissions. The proceedings of HMM2004 were published and are available in an elegant format by Kluwer Academic Publishers (www.wkap.nl) for a wide long-term circulation. The proceedings of HMM2004 can be considered of great interest for individuals and libraries as a historical source of technical backgrounds. Original sources of technical achievements and works are referenced in the papers so that these proceedings can be also considered a kind of handbook on History of Machines and Mechanisms. A Workshop on History of MMS was held at Kustodie of Dresden Technical University on October 6-8, 2004 within the activity of the IFToMM Permanent Commission for History of MMS. The workshop was organized under the Scientific Chairman Coordination of dr Hanfried Kerle (Technical University of Braunschweig), Dr. Klaus Mauersberger (Kustodie at Dresden Technical University) and prof Marco Ceccarelli (University of Cassino, PC Vice-Chairman for Workshops on HMM), and with the local organization of prof. Karl-Heinz Modler (Chair of TMM at Dresden Technical University). The meeting was organized for facilitating presentation of unpublished material, discussion and promotion of interest on historical subjects on machines and mechanisms (HMM). Ten lectures, each with duration of about 30 minutes, were presented concerning with the historical material in design developments and theory evolutions of TMM. Participants are listed in the citation of the enclosed photo. The local organizers also offered very interesting guided tours through the exhibitions “Collections and History of Engineering Education – especially in TMM” in the Kustodie and “Collection of Mechanism Models” of the Institut für Festkörpermechanik. A specific visit was held in the “Mathematisch-physikalischer Salon” of the Zwinger too. 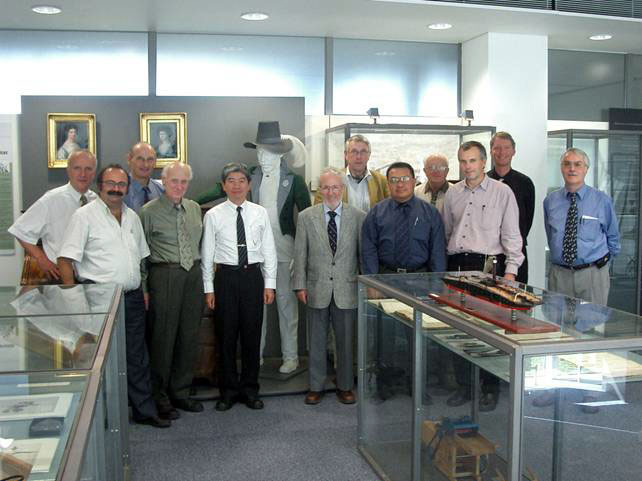 Participants at the 2004 Dresden Workshop on HMM: (from left to the right) prof. Karl-Heinz Modler (Germany), prof. Marco Ceccarelli (Italy), prof. Kurt Luck (Germany), prof. Alexander Golovin (Russia), prof. Hong-Sen Yan (China-Taipei), prof. Francis Moon (U.S.A.), prof. Teun Koetsier (The Netherlands), prof. Carlos Lopez-Cajùn (Mexico), prof. Rudolf Neumann (Germany), dr.. Klaus Mauersberger (Germany), prof. Burkhard Corves (Germany), dr. Hanfried Kerle (Germany); (not in the photo) prof. Baichun Zhang (China-Baijing), dr. Peter Plaßmeyer (Germany). During the 15th CISM-IFToMM Symposium on Robot Design, Dynamics and Control (ROMANSY 2004) that was held in Montreal, Canada, in June, a special celebration was organized in honour of the 60th birthday of Professor Jorge Angeles. 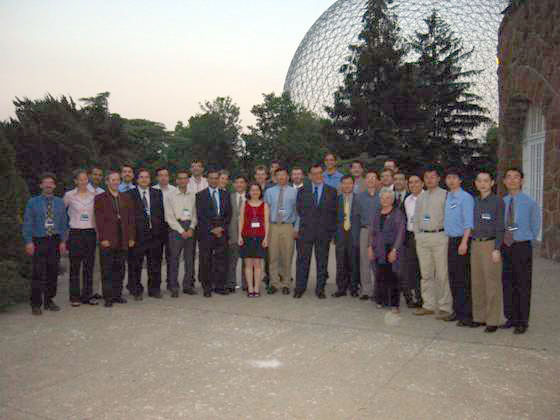 This event, which took place during the banquet of the ROMANSY conference, was organized by a group of Jorge Angeles' former graduate students led by Farzam Ranjbaran from the Canadian Space Agency. Several of Jorge Angeles' former and current graduate students made a special effort to attend the event, some travelling from countries as far away as Korea or Israel. A collage assembled by the group of student was presented to Jorge. The celebration also included entertainment by a Mariachi band, a Mexican folklore group and a guitar singer. Several of Jorge's colleagues from different countries (including the IFToMM President, Ken Waldron, and the IFToMM Secretary General, Marco Ceccarelli) also delivered congratulation speeches. The event was completed by the participation of Jorge's wife and sons. The attached picture shows Prof. Angeles with those of his former and current graduate students who attended the celebration. The giant geodesic dome provides a most appropriate background.